TRC’s Transition Services help to get the assignee settled and productive as rapidly as possible. We draw on our global alliances to arrange temporary housing that meets your assignee’s needs and budget at a lower cost than an extended hotel stay. TRC’s local experts will arrange tours of public, private, international or specialized schools as appropriate and assist with the interview, selection and registration processes. We can also identify tutoring or special-needs resources as needed. TRC’s Home Search services begin with a thorough orientation tour, to familiarize the assignee and family with possible neighborhoods and local amenities. Then, our WorldSource™ partners work within your company’s policy parameters, showing assignees candidate properties and helping them to select a suitable home. After the assignee selects a home, our partner will negotiate the most favorable lease terms possible. Drawing on the family information gathered by the Global Assignment Counselor, our local WorldSource™ partner will help the expatriate family to establish their new life in the host country. TRC’s Setting-In services can include assistance in establishing bank accounts and credit; help with vehicles and transportation; registration with local government; insurance/social security documentation; detailed area tours and introductions to local expatriate or social clubs. American Welcome is TRC’s exclusive program designed to meet the needs of international assignees working in the United States. 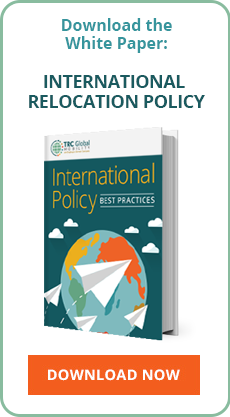 The TRC Global Assignment Counselor will assess the assignee’s familiarity with American culture and the destination location. The GAC will provide customized information, coordinate required pre-departure services and share family profile information with local destination service providers. TRC’s MoveSource™ partners are highly qualified moving and storage specialists that have demonstrated superior service. We monitor cost estimates, service capabilities into various areas of the world, shipping date availability, world transportation-related events and other details. A trained and dedicated crew provides packing, wrapping and loading services for the international assignment. All corporate moving services include specialized overseas wrapping and containerization. We require each container’s contents to be itemized and our freight forwarders “live load” (one time handling) at the employee’s residence to minimize exposure to damages. The most practical routing is chosen, keeping in mind the time frame and cost requirements.